Oh, RIGHT!!! The Unseen is out! In bookstores!! RIGHT NOW!!!! And then a few years ago I was visiting Michael in North Carolina and, as he is wont to do, he handed me a column torn out of the newspaper about a lecture on the Duke campus called: “Secrets of the Rhine Parapsychology Lab” and said, “You should go to that.” Because he knows I like that kind of thing, but he had no idea that I’ve been obsessed with Rhine since I was – seven, eight, whatever. So you know that question authors love: Where do you get your ideas? That’s where I got my idea for The Unseen. From the double extra large Southern man I live with. Get yourself one, they’re worth the trouble. Most of the time. So now, for those of you who find the above intriguing, and/or who like your mysteries with a touch of the real-life uncanny, and/or who have gotten something out of my story structure posts, or who just love me in general, here’s your chance to show the love. Go buy The Unseen from your favorite independent bookstore RIGHT NOW, or if you can’t bear to think about getting dressed today, from Amazon (and then go buy great greeting cards and other people’s books from your favorite independent bookstore the next time you’re dressed and out of the house. If ever. Because I’m hardly one to make assumptions about that.). And now it’s your turn: tell us about a project that caught fire with the perfect research factoid. Or about a subject you wish you could find a thriller or mystery about. Or, on a completely different track: have you ever experienced a crisis apparition, a precognitive dream or visitation, or sympathetic pains? Or do you know anyone who has? Do you believe these things happen? Buy or reserve a copy now! I'm doing a very laid back, non-Konrath, un-type-A blog tour in between running around doing the physical tour thing, so check here for updates if you'd like to drop in and explore other blogs. - Thursday, 5.28: Meanderings and Muses: "Lessons from the Back Seat"
- Saturday, 5/30 and Sunday 5/31 - Jungle Red Writers: "Book Launch Diary"
And for those of you who are looking for the story structure articles, in order - I've compiled a Table of Contents with links to make things easier for everyone. If you're in Los Angeles, I'm giving a half day workshop in Burbank on June 13. Details here. Have a great week, everyone, and I hope you enjoy The Unseen. 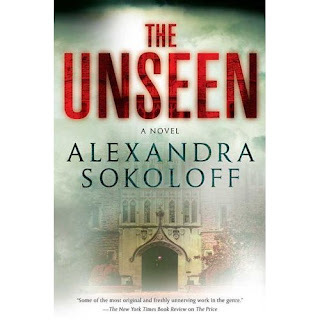 Can't wait to read The Unseen. My copy is sitting on my nightstand as I type. I love you guys! Thanks, David. You're keeping authors in business. Um, sorry about that! Should be linked now. This novel sounds flippin' amazing. Love the premise. It's officially on my radar now. Congratulations on the release of The Unseen. And it sounds like your book tour is going well - if you like waking up by the Hudson now, try it in October. Fall is almost painfully beautiful there. As for your questions, there's just too much to answer and not enough time - but later! I have a funny story to share with you about those Zener cards, and yes - I have had one or two precognitive/telepathic experiences (I don't see them as extraordinary, but I do wish I had some control over them - or that they were, at least, useful). They seemed quite random. Thanks to the Wolf and Fox - I love it that you guys showed up simultaneously! And Holly, yeah, fall is my favorite time in NY. Actually it's my favorite time, period! Would love to hear your Zener card story sometime.